OK these aren’t exactly Gothic! They’re not really exactly spooky either… but anything steampunk still looks awesome! 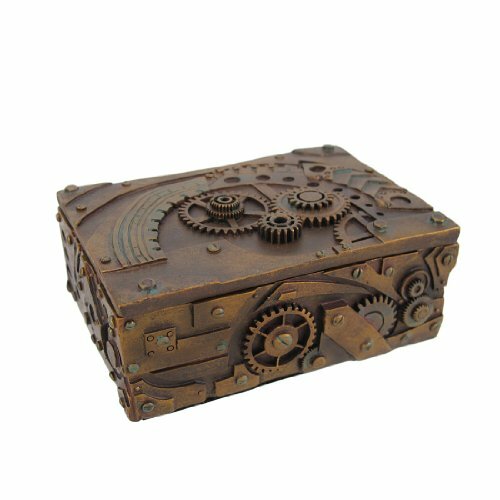 So I decided to go ahead and write a quick feature on these awesome steampunk jewelry box models that you can buy online. 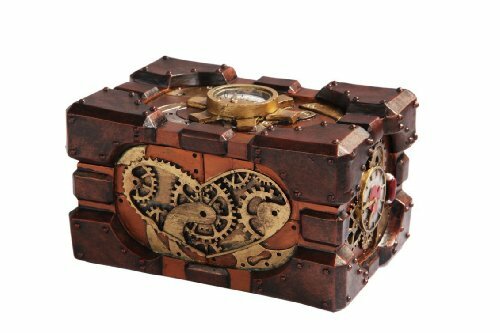 You can rest assured that the nuclear fallout has nothing on these awesome steampunk jewelry boxes! Stash your favorite items or unwanted paraphernalia away from prying eyes once and for all. So without further ado, please check these out! Alright this one is a great place to start. I didn’t like that color scheme at first glance but when you start to notice the details it just blows you away. And come on, it has a working compass on the top! This would easily be the most USEFUL choice, especially in a fallout! On the other hand, would all the radiation affect the earth’s magnetic fields?! Better safe than sorry! Something about this model speaks to the minimalist in me! I like the color scheme WAY better for sure and the rusty bronze finish reminds me of something out of Book of Eli or Mad Max. This is probably the most visually striking of the models and maybe that’s because of the simplicity in the design. No random colors or anything to detract from the dirty steampunk jewelry box rust! This seems like it would probably be the case after a worldwide nuclear fallout. ME LIKE-Y! Alright maybe you like your steampunk jewelry box with a side order of sugar and spice and everything nice? For all you steampunk ladies out there, this would be the choice. This design features a cool pressure gauge on top and a detailed gearwork heart on the front! Perfect for all your love letters forgotten by time–all of them to be aged to radioactive perfection in the fallout. On a side note, this color scheme somehow reminds me of that awesome hand-painted book Dinotopia! Gotta go read that again all of a sudden. BIG surprise. Nothing between the ears. Seriously though, this may not look like it would have the most storage space but it’s actually the most ﻿﻿Gothic﻿﻿ of the bunch, right? And it will pretty much dominate the shelf you put it on so forget about hiding anything particularly important in there. I can just see nosy guests coming up to the awesome bronze finish and taking a peek inside! Well, maybe it would better serve as the alternative–the manufacturer says it doubles as an ashtray! 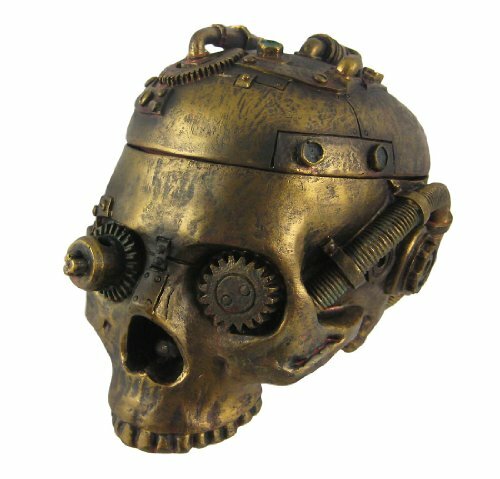 Steampunk jewelry box AND skull ashtray, all-in-one! 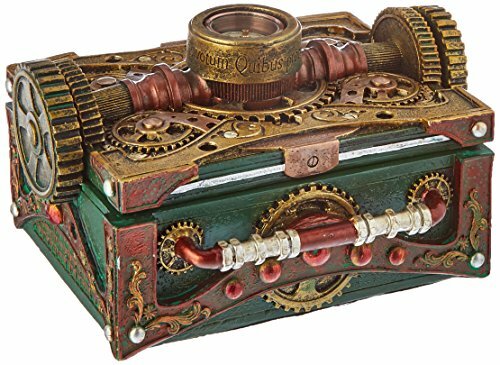 So keep your little trinkets safe from the fallout with anyone of these awesome steampunk jewelry box models. They look cool and stylish and certainly won’t break the bank! Take your pick and live Gothic… uh… I mean live steampunk today!